Sir Cuthbert, a member of Chapter of Concord, Durham and a Past Master of Sea Captains Lodge became a Joining Member of Chapter of Strict Benevolence at the meeting held on 7th January 1830 in the Sea Captains Lodge room in the Golden Lion Inn, Sunderland. 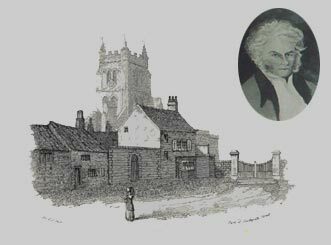 Sir Cuthbert was born in Hartlepool and was the son of Cuthbert Sharp and Susannah Crosby, sister of Brass Crosby who was Lord Mayor of London in 1791. Sir Cuthbert played a very prominent role in the affairs of this Chapter in the decade prior to the 13 year break despite his many and varied interests. He served as Deputy Provincial Grand Master in 1832. Sir Cuthbert was a distinguished antiquarian and a good friend of Sir Walter Scott. He was also a friend of Robert Surtees of Mainsworth and gave him great help in writing his History of the County Palatine of Durham. George Garbutt, in his History of Sunderland acknowledges the generous and obliging readiness of Sir Cuthbert in imparting information and advice. He distinguished himself in many areas of literature, including poetry, ancient ballads, and more locally in his historical research of the ancient Hilton family of Hilton Castle, now named Hylton. He was also accomplished at etching though not in drawing. He signed the etching of his birthplace, copied from his book, above. Sir Cuthbert served as a cavalry officer in Ireland before setting off to travel in France. Unfortunately he was taken as a prisoner of war but eventually made his way back to England and settled in Hartlepool for a long period of study. In 1816 he published his best known work “A History of Hartlepool”. In the same year he became Mayor of Hartlepool and was knighted by the Prince Regent. Sir Cuthbert became Sunderland’s Collector of Customs in 1823. He sat on many committees with the River Wear Commissioners and was active in the interests of the Port of Sunderland particularly in making the case for wet docks.